From historic West End houses to smaller fringe spaces, London’s West End (or “Theatreland”) is one of the most vibrant theatrical neighbourhoods in the world. Now, visitors to the area can learn more about its rich theatrical history from one of British theatre’s biggest stars: Sir Ian McKellen. 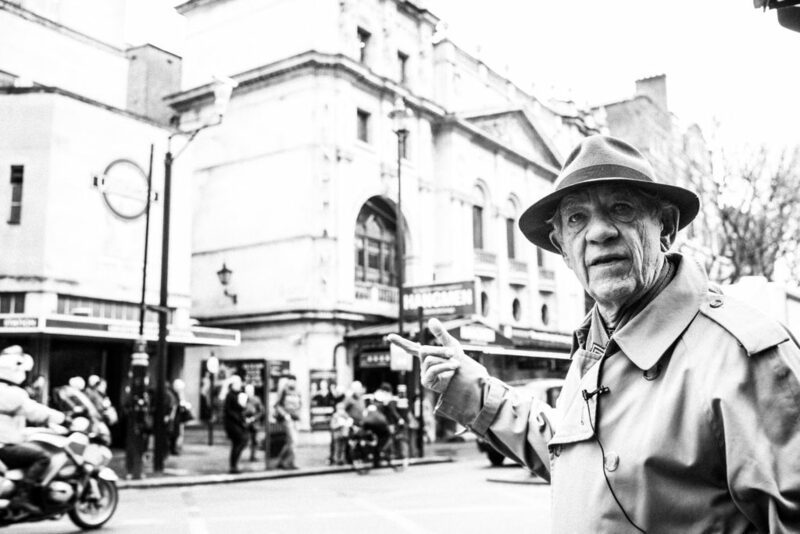 This spring, the Society of London Theatre (SOLT) partnered with VoiceMap to debut the Official London Theatre Audio Tour with Ian McKellen, a free audio tour in which McKellen guides listeners through both iconic and lesser-known sights in the West End. After embarking on McKellen’s insightful tour, Marianna Meloni gave her impressions of this new way to experience London’s Theatreland. When I moved to London in 2007, I was impressed to find out about the high concentration of theatres in London’s West End. The term “West End theatre” refers specifically to a mainstream professional theatre hosting commercial productions around the West End of London. But in the same geographic area, there are around 50 different mainstream, fringe and live performance venues, which constitute the most prolific theatrical district in the world, offering entertainment to approximately 50,000 people every night. So far, I’ve only been to 33 of these venues, and every time it felt like I was entering a magic world. Top class performances mingle with the history and architecture of amazing buildings, about which I’ve always wanted to learn a bit more. The Official London Theatre Audio Tour with Ian McKellen is a great opportunity to discover some of the most iconic and lesser-known corners of Theatreland, through episodes from the past, secret stories and personal anecdotes told by one of the most illustrious British actors of all time. Since he started his career in 1961, McKellen has won six Olivier Awards—considered the utmost stage acknowledgment in Britain—and has produced and starred in productions for the Royal Shakespeare Company, National Theatre of Great Britain and in the West End. 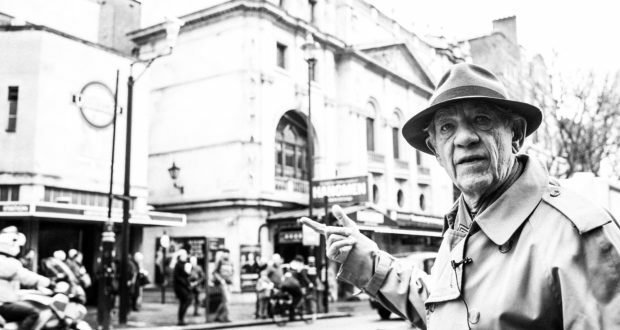 The Official London Theatre Audio Tour with Ian McKellen is a great opportunity to discover (…) Theatreland, through episodes from the past, secret stories and personal anecdotes told by one of the most illustrious British actors of all time. Before starting my tour, I had to download the VoiceMap app and the Theatreland Tour with Ian McKellen, which is a free download within the app. I also found some detailed instructions and useful tips on the app’s home page about how to make the most of my visit. If possible, it’s advised to avoid the hustle and bustle of theatre entry (between 6:30pm and 7:30pm) and exit (around 10pm). Crossing the street requires extra care: Charing Cross Road, Shaftesbury Avenue and the Strand are heavily congested bus routes, and even the smallest streets get busy with city cabs. The app didn’t need to use any of my network allowance, although I experienced some difficulties when my phone data was disabled. Relying on the phone’s GPS, the audio tracks have been programmed to start when reaching the designated point; that way, there’s no need to worry about keeping the pace or needing to take a break. The level of precision, though, had some flaws: my companion and I noticed that our phones weren’t necessarily starting at the same time or, even, that they missed the GPS waypoints altogether. I set my mobile’s location in high accuracy mode and I also took a splitter to connect two pairs of earphones to the same device, in case one of them let me down. Alternatively, you can override the GPS-related inconveniences by manually selecting the audio cues on a map, although this might affect the narrative flow. Before starting my journey, I checked that my phone was fully charged, or I would have taken a power bank with me. VoiceMap is a low-consuming app but will definitely require more battery than just listening to normal audio tracks. The tour begins at the TKTS tickets booth in Leicester Square, where free WiFi is available to download the app if you haven’t done so in advance. 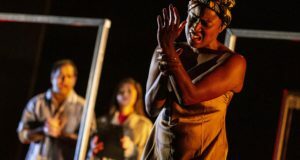 TKTS is run by the Society of London Theatre (SOLT), a non-profit organisation that represents the voice of theatre owners, producers and managers of all the major commercial and grant-aided theatres across London. Its ticket kiosk is a collective box office for London’s main productions, and is also a great place to snap up some last-minute deals. If I had ever wondered which West End show holds the record for the longest run or who David Garrick, the namesake of the theatre on Charing Cross Road, was, Sir McKellen gave me the answer. After giving a little technical information, Ian McKellen led me in a charming and friendly manner along a trail of landmarks that have a generally recognised importance for Theatreland or a personal relevance for the actor. Within the span of about an hour, I went down and uphill, from the Palace Theatre to Somerset House, discovering the meaning of monuments that I unknowingly went past for years, like those dedicated to Agatha Christie and William Shakespeare. 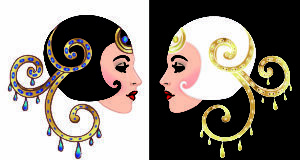 I learnt the dramatic events of theatres that were destroyed by fire several times, like the Theatre Royal, Drury Lane. And, if I had ever wondered which West End show holds the record for the longest run or who David Garrick, the namesake of the theatre on Charing Cross Road, was, Sir McKellen gave me the answer. Following his well-timed and entertaining talk, I easily found my way around Covent Garden’s maze of alleys, uncovering the real purpose of Seven Dials and hearing of some gruesome murders. Whilst giving me the opportunity to concentrate on the walk and make the most of the beautiful surroundings, the audio track taught me who Nell Gwynn was and the crucial role that Henry Irving had in the development of acting as a respectable career. All this with the added value of Sir Ian McKellen’s guidance, along with his will to share some of his private memories about his beginnings as a drama student and professional debut. If you, like me, are a passionate theatregoer with a growing hunger for trivia about London’s West End, this audio tour is a delightful and unmissable experience. The Official London Theatre Tour with Ian McKellen can be downloaded online here, or directly through the VoiceMap app.